Nuts - Your Secret Weapon for Weight Loss? Anyone who's ever dieted will know that nuts are high in calories - at over 50% fat, should they be a no-go when it comes to losing weight? With an explosion in nut snacking in the UK, the interest in nuts and their health benefits has never been more intense. We thought it would be good to delve a bit more into the science and find out whether it's a 'yay' or 'nay' when it comes to nuts and weight loss. Nuts are actually a highly nutritious food - they provide nutrient storage for the plants and trees that produce them, so inside each nut is a whole plethora of good things! Providing a range of important nutrients including protein, fibre, selenium, zinc, copper, vitamin B6, folate, iron, calcium...the list goes on - nuts can be an important source of nutrition in the diet. Fat levels are high but it's mainly unsaturated fat (polyunsaturated and monounsaturated) which has been shown to be beneficial when it comes to heart health. Unfortunately fat still comes in at 9kcal per gram, whether it's unsaturated or saturated, which means that nuts are calorie dense. You might have seen Britain's Favourite Supermarket Foods on the BBC recently which highlighted Britain's new love affair with nuts! An amazing 227,000 tonnes of nuts were sold in UK supermarkets last year - that's a staggering amount. Shops have done a great job at sourcing and providing a wide variety of different nuts, meaning we have plenty of choice. Gone are the days when nuts were just for Christmas (remember the bowls of nuts still hanging around in April?). Whether you like almonds, brazil nuts, cashews, peanuts, macadamias...they're all available, all year round. The principles of weight loss are to reduce the number of calories you're eating to mobilise some of the stores of calories from the body (i.e. fat stores) which over time will result in weight loss. Makes sense? So it figures that a food that is very calorie dense might not be the best option for someone trying to reduce calorie intake. That's where science has thrown us a curve ball. New research has shown that eating nuts, and in particular almonds, can actually help with weight loss. The number of calories you gain from eating the nuts doesn't add up to weight gain on the scales. In fact, eating nuts can offer a whole host of benefits - they are packed full of protein and fibre which can help to fill you up, and hopefully stop you snacking on other less healthy snacks, plus they contain many of the essential micronutrients we need every day. An interesting part of the programme on supermarkets showed how nuts can help with weight loss - it seems that if you eat whole nuts they're not digested as fully as other foods, so we actually get rid of parts of the nut which contains the fat. So we actually only absorb about ¾ of the total calories in a handful of nuts. But be aware - if you have finely chopped nuts or nut butter (such as peanut butter) this calorie saving won't happen! The Almond Board of California recommend snacking on around 23 almonds a day (30g) as part of a healthy weight loss plan. 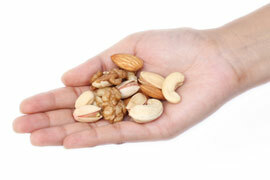 Having a handful of nuts when you feel peckish can stop cravings for sugary snacks so it might be worth a try. So why not give it a go and see what happens - here in the Nutracheck office we have drawerfuls of nuts, and find them to be a delicious and nutritious snack! Remember to include them as part of an overall healthy balance though - we don't want you dropping your fruit and veg intake, or any of the other important food groups either.